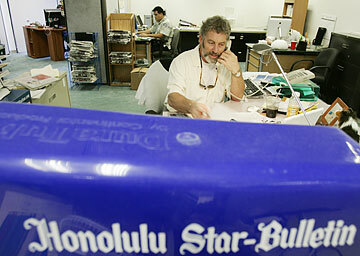 Leo Geensen, an advertising account executive for the Honolulu Star-Bulletin/MidWeek, talks on the phone with a client. THE FIGHT FOR ADVERTISING DOLLARS has many warriors donning armor each day, from daily and weekly newspapers to television and radio stations, local general and special-interest magazines, tourist publications, Web sites, parking-garage walls and other entities. Speaking only of the competition between newspapers, industry analyst John Morton sees many advertisers underallocating print advertising dollars. "Advertisers like to have the price competition. They don't, unfortunately, tend to spend as much a week per paper as they should." He cited the example of the Washington Star, in the nation's capital, where advertisers told the paper it was important that it stay in business, but in "allocating spending, they (didn't) do it proportionately to circulation." It had 35 percent of the circulation in its market, but its advertising share was 20 percent to 22 percent, Morton said. The more than 128-year-old newspaper published its last edition in 1981. In a one-newspaper town, the daily "has much more power to raise ad rates," he said. Despite competition and what Honolulu Star-Bulletin Publisher Dennis Francis calls "rapidly" declining circulation at the Honolulu Advertiser, he said it has raised advertising rates in the past five years. "The advertising community is getting 30,000 to 35,000 less in Advertiser circulation ... and yet ad rates went up." Advertiser President Mike Fisch did not return repeated phone calls over the period of a week for this story. Despite the increase, agencies have benefited from the demise of the joint operating agreement and the resulting competition between the papers. "The battle on Oahu has actually wound up saving the advertising agencies money," said Kim Bock, media director at the Harris Agency LLC. "I never go off a rate card" because both papers' advertising executives are able to put together creative advertising packages, she said. It costs more to advertise in the Advertiser, "but you get more circulation," she said. Still, "when you're comparing paper to paper and you throw in MidWeek and Island Weekly, it's comparable on a cost-per-thousand (copies) basis." Part of the reason for the Advertiser's increased rates is color, Bock said. There is no option to buy a black-and-white ad because the rates include color, so it behooves clients to prepare color ads, she said. "You might as well run a color ad, because you're paying for it," she said. "The icing on the cake is, compare this to neighbor island advertising. It costs me $78 per column inch to buy the neighbor-island dailies combo. It costs me more on a per-column-inch (basis) to buy neighbor-island circulation than either the Star-Bulletin or Advertiser," when the neighbor islands' total daily circulation does not match the Star-Bulletin's, Bock said. Laird Christianson Advertising Inc. generally recommends a client run ads in both daily papers, said its president, Buck Laird. "We always look for the best efficiency and the biggest bang for the buck." If the client's budget is not sufficient, "then it's purely a tactical decision, it's not purely money. There may be reasons we'd pick one or the other." For instance, "The Star-Bulletin has kind of been described as a second child and a little bit more of a risk-taker, a little bit more edgy," Laird says. If the type of reader likely to pick up the Star-Bulletin suits the ad client's desired audience, the Star-Bulletin will get the buy. "Now that we have some experience and our advertisers share with us the results that we get, we tend to get a feeling for which publication works best in which situation." Laird is "delighted" that there are two papers. "The community is better served" in terms of the general market and the advertisers.